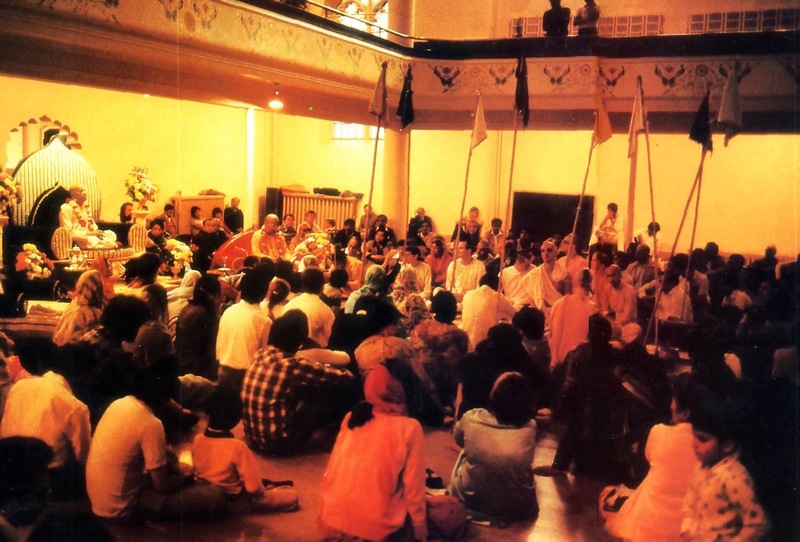 BTG Article About ISKCON Toronto & Montreal from 1983! ~ The Toronto Hare Krishna Temple! 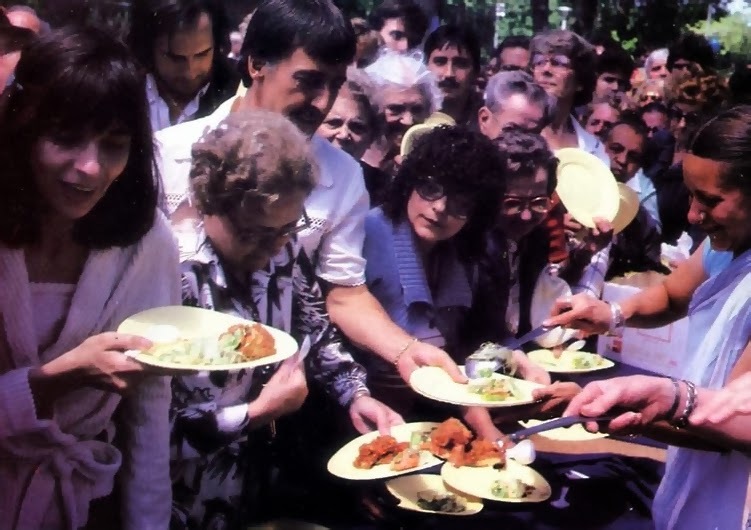 BTG Article About ISKCON Toronto & Montreal from 1983! Another great find! We found an online version of an article from the February/March 1983 issue of the Back to Godhead Magazine which featured Krsna consciousness in Eastern Canada. It's a bit of a long read, but certainly worth it! Check it out! The traditional chanting, dancing, and worship are all going strong, but there’s much more. 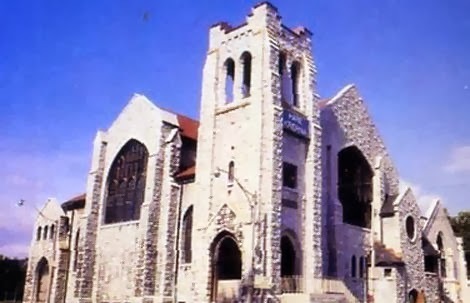 About a decade ago the Hare Krsna devotees in Canada bought two churches—one in Toronto and one in Montreal—and caused a bit of consternation. Their neighbors wondered just who they were and what they were going to do. 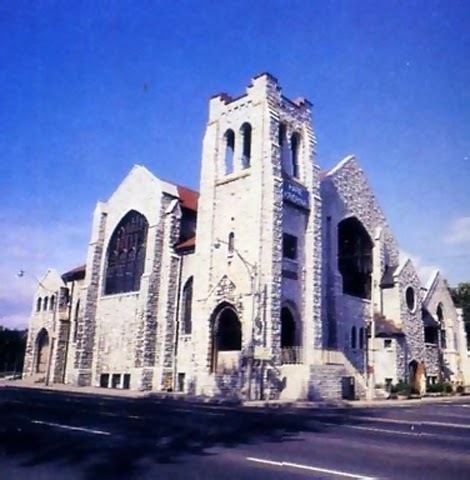 The Hare Krsna church-turned-temple stands proudly on Avenue Road, one of Toronto’s busiest thoroughfares. Today these fears are gone. Krsna consciousness has become firmly established in eastern Canada—not just in Toronto and Montreal but also in the nation’s capital, Ottawa—and the large incandescent HARE KRISHNA sign on the high stone walls of the Toronto temple raises hardly an eyebrow among the people in some 25.000 cars that pass by each day. Still, for many Canadians the questions remain: What do the Hare Krsnas do? And why? For several weeks last summer I lived with the Canadian devotees and saw how they put these principles into practice. As in all Hare Krsna temples, the devotees in Canada begin the day at 4:30 in the morning with a formal arati ceremony. 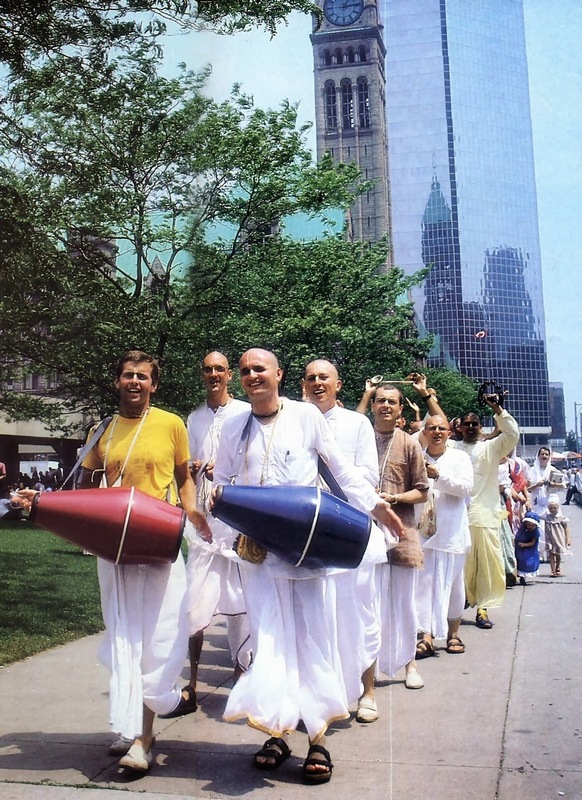 Accompanying themselves on drums and hand cymbals, they sing prayers to the spiritual master, a pure representative of Krsna and the devotees’ spiritual guide and source of inspiration. Then they chant the Hare Krsna mantra in chorus. Before initiating new disciples at a recent ceremony in the Toronto temple (above), Srila Gopala Krsna Goswami (on red velvet seat of honor) explains the relationship between guru and disciple in Krsna consciousness. After the class, everyone rises to sing more prayers glorifying the spiritual master. Then it’s breakfast time, followed by the start of the day’s devotional activities. 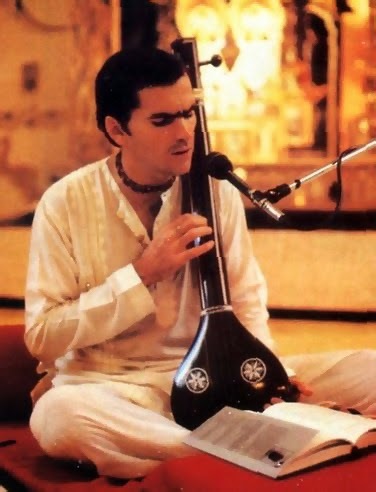 Nandikesvara dasa, leader of the Montreal center, play a traditional Indian tamboura as he sings the glories of Lord Krsna. Visvakarma also told me about his large congregation of Indian life members. 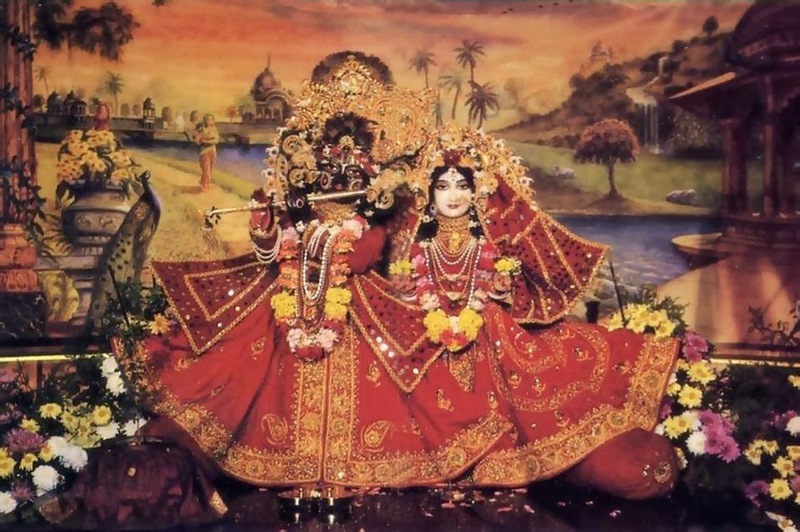 They’ve seen that the devotees are following the genuine Vedic culture, so they enthusiastically support the temple. Two members, Syama-Krsna dasa and his wife, Kunti-devi dasi, recently took spiritual initiation from Srila Gopala Krsna Go-swami, who oversees the movement’s affairs in Canada and initiates new disciples there. 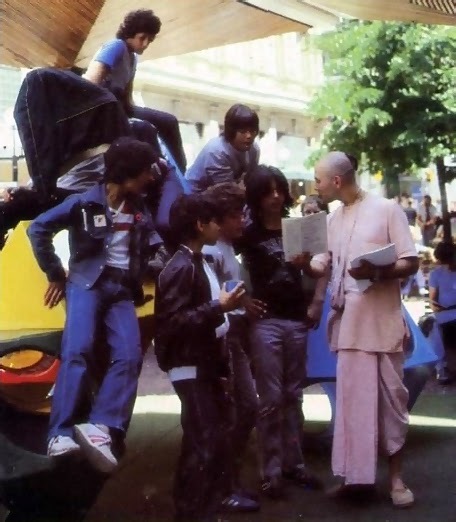 At a shopping mall in downtown Ottawa, Gaura dasa interests some youngsters in the latest issue of BACK TO GODHEAD. 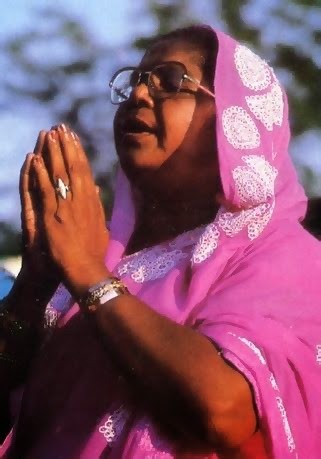 Mrs. Elizabeth Mohar, one of several thousand members of the Toronto temple’ s congregation, prays to Lord Krsna during an outdoor festival last summer. To find out about the Krsna conscious drama being performed in Canada, I talked to Nanda-kisora dasa in Montreal, He’s been putting on plays about Krsna for ten years, and now he’s directing a production based on the Mahabharata, India’s great epic poem of 110,000 couplets. The Mahabharata relates a complex scries of political events that culminated fifty centuries ago in the Battle of Kuruksetra, a devastating war of royal succession in which Lord Krsna Himself took part. The Bhagavad-gita is part of the Mahabharata. 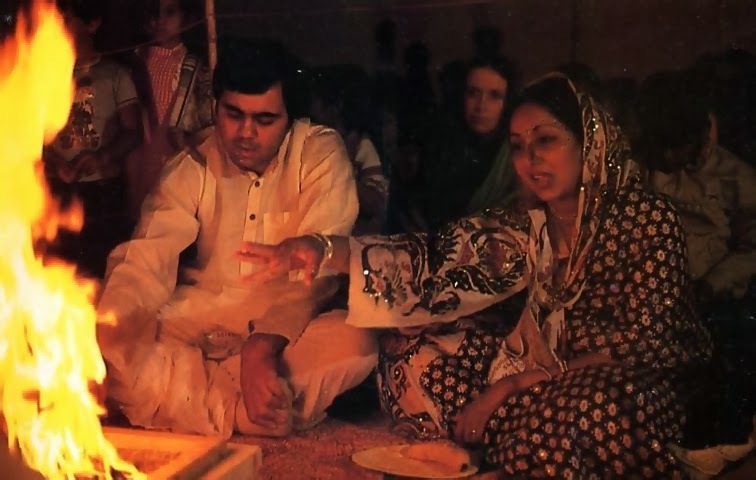 Newly initiated Syama -Krsna dasa and his wife, Kuntidevi dasi, throw grains into the fire during a ceremony held last summer in the Toronto temple. “Dramatizing the Mahabharata is like sculpting,” said Nanda-kisora. “The entire story is like a large stone that must be cut and formed into a play that presents the essence of the work. Ideally the finished production should be so absorbing that the audience should forget they’re watching a play. They should be drawn into what’s happening onstage as if it were real life.” The production I saw did just that: the members of the audience were transfixed by the play, fully absorbed in Krsna consciousness. I also learned that another troupe, in Toronto, puts on a play based on the Ramayana, the epic about Krsna’s incarnation Lord Ramacandra. And I heard that one devotee performs ballet and classical Indian dance to portray the Lord’s pastimes. A drama unfolds onstage at the Montreal center. 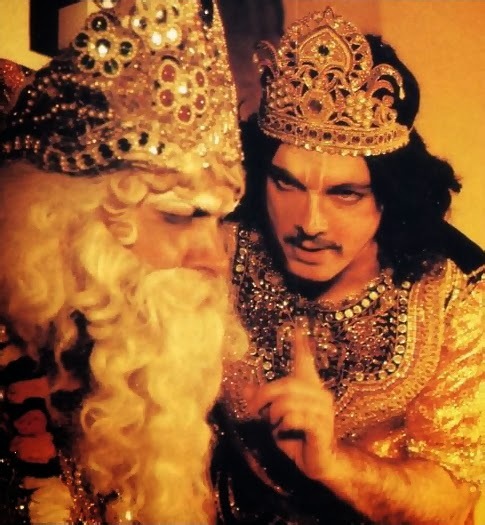 In a production of the Vedic classic Mahabharata, the wise Vidura played by Nanda-kisora dasa) warns King Dhrtarastra (played by Gopisvara dasa) of the dangers inherent in a rigged gambling match. I knew my visit wouldn’t be complete without stopping at one of the prasadam restaurants. Nandikesvara showed me around Chez Govinda in Montreal. He suggested I try the Tofu Burger, a favorite among patrons. 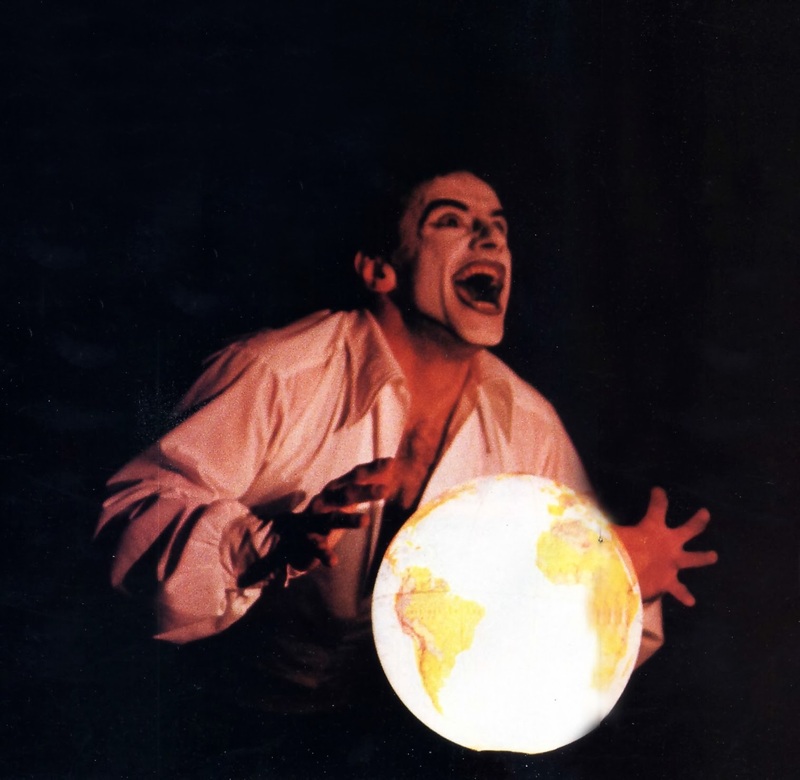 Bhakta Luc pantomimes someone trying to control the earth. I could hardly hold it in my hands, let alone fit it into my mouth, but somehow I chomped into it. Wonderful! Between light, homemade whole-wheat buns was a base layer of sour cream sauce, then lettuce, a slice of tomato, a half-inch-thick fried tofu patty, alfalfa sprouts, thick melted cheese, and then tomato sauce—all bulging out. It was exquisitely delicious! 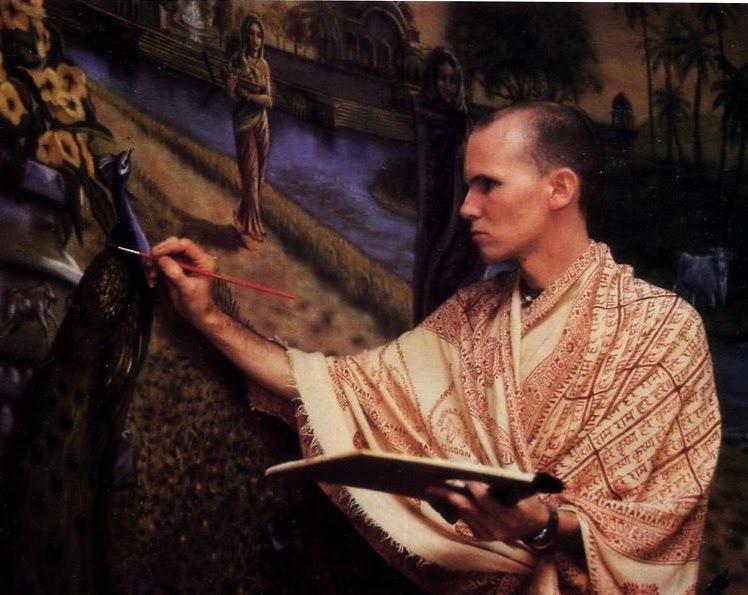 Deep in creative concentration, Visnu dasa puts the finishing touches on the backdrop for the altar in the Toronto temple. “That’s just for a start,” said Nandikesvara, laughing as I grappled with the expansive munchie. “Now this is the Cosmic Special.” It was an eight-inch-wide capati (a round, whole-wheat tortilla) decked with thick avacado puree, tomato slices, melted cheese, sunflower seeds, and fresh alfalfa sprouts. “What do you think of that?” Nandikesvara asked. 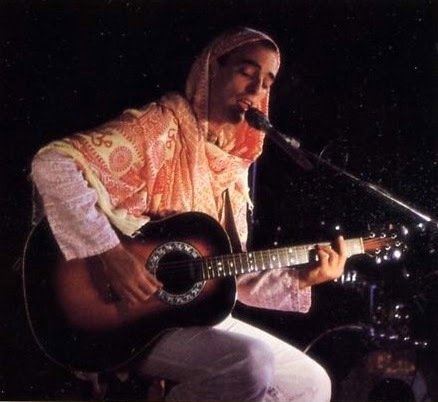 Mahavirya dasa sings of Krsna in Montreal. Next I asked Punyakirti dasa, who manages Chez Govinda, about the restaurant’s interior. “The devotees did it all themselves,” he told me.” Abhay Charan made the wrought-iron table legs and matching chairs, Dana-keli did the plumbing, wiring, and kitchen installations, and Visnu dasa hand-painted the wall mural.” This monumental piece of artwork consists of seventeen panels separated by hand-cast columns and arches. A warm glow of bonhomie radiates from the entrance to Chez Govinda, the vegetarian restaurant run by devotees in Montreal. 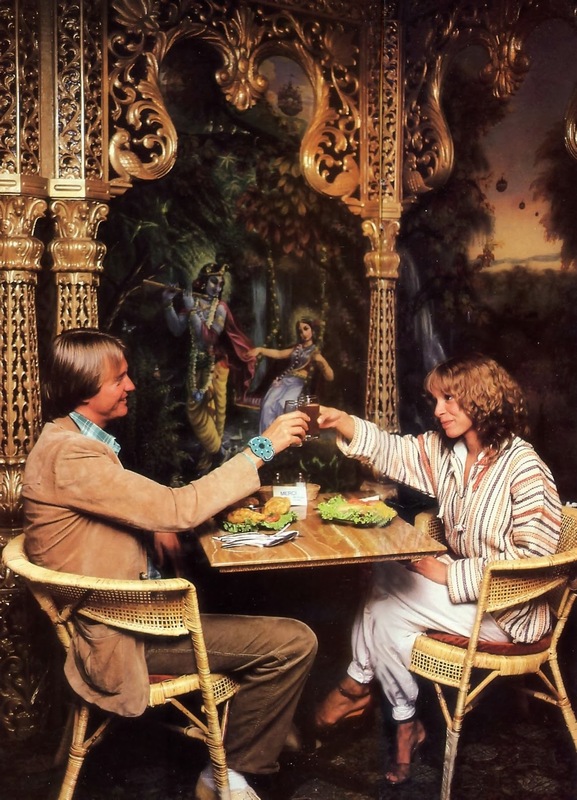 And not only arc there fine cooking and natural ingredients, but everything is offered to Krsna – which makes eating at Chez Govinda a spiritual experience. 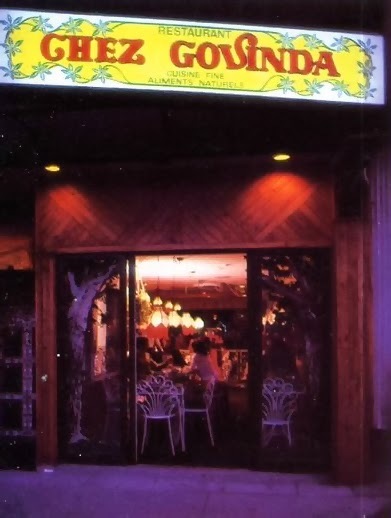 Unfortunately, I never did get to visit the Back Home Buffet, the devotees’ restaurant in Ottawa, where I heard they serve a different national vegetarian food every day: Italian food one day, Indian the next, Mexican the next, then Oriental, then American. Maybe I could go back and do a special article just on the Ottawa restaurant. Of course, I’d have to sample all the national dishes . . . In any case, from what I saw of the Hare Krsna devotees in eastern Canada, far from bringing consternation to their neighbors, they’re winning congratulations. The temple programs, the restaurants, the art, music, drama, and dance, what to speak of the summer celebrations like The Festival of the Chariots and Lord Krsna’s Appearance Day, all add up to a multifaceted expression of Krsna culture that has something to please everyone.